" Indiana's GOP Governor Will NOT Get to Appoint a Replacement for GOP SoS Charged With Voter Fraud	"
Indiana House and Senate negotiators have agreed to drop a provision that would have let Gov. 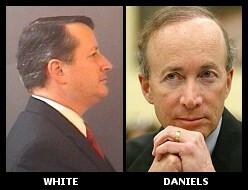 Mitch Daniels appoint a new secretary of state if indicted fellow Republican Charlie White is found to be ineligible. The agreement was filed Thursday, a day after a top House Republican said she was uncomfortable with lawmakers intervening in an ongoing court case. The agreement on the bill applies the appointment provision only to future elections. Both the House and Senate still have to approve the compromise for it to become law. So, it seems, the hope of Republicans to have their governor replace White has now been dashed --- assuming the House/Senate compromise bill is passed and signed by Daniels. In the meantime, Marion County Circuit Judge Louis Rosenburg held another hearing in the civil case on Thursday, after he had ordered the state Republican Committee to explain why they should not be held in contempt for ignoring his previous rulings in the case. Earlier this month, Rosenburg had ordered that the state Recount Commission review the Democrats' complaint against White's eligibility to be on the ballot, after they had dismissed it last December following his election. The judge ruled their complaint was valid and that the commission --- which has a 2 to 1 Republican majority, should move quickly to investigate and resolve the matter. One of three members on the commission is White himself, though he has recused himself from the case. However, the state GOP had failed to name someone to replace him, further helping to stall the matter, until Rosenburg ordered earlier this week that someone be appointed within two days. They finally complied. At Thursday's hearing, Rosenburg denied White's motion to put the civil case on hold until after his criminal case was resolved. according to the Indianapolis Star, the judge said "the public interest is in resolving this matter." He went on to charge the uncertainty about the charges and the validity of White to serve are "impairing" the ability of the Secretary of State's office to carry out their duties. Following the hearing, state Democratic Chairman Dan Parker said, "Hopefully there are going to be some deadlines set so we can get discovery moving, we can get the case moving and people can finally know once and for all who their secretary of state is going to be." For their part, White's attorneys said they intend to appeal Rosenburg's ruling. They have already filed an appeal to the April 7th decision finding the Indiana Recount Commission had improperly dismissed the Democrats' challenge to White's eligibility to be on the ballot. On Tuesday, a New York Times editorial slammed what they called the latest "Republican Threat to Voting," as laws likely to disenfranchise millions of legal, Democratic-leaning voters are once again being pushed by GOP legislators in state after state. The effort is described as "the largest legislative effort to scale back voting rights in a century," as Republicans in "more than 30...states...[are joining] the bandwagon of disenfranchisement, as Republicans outdo each other to propose bills with new voting barriers." "Spreading fear of a nonexistent flood of voter fraud," the paper wrote, "they are demanding that citizens be required to show a government-issued identification before they are allowed to vote." While some 21 million legal voters --- mostly minorities, students, and some elderly --- do not have the sort of state-issued Photo ID that would be required under such laws, polling place impersonation, in fact, is extremely rare. Of far greater danger to elections, at least in the realm of voter fraud, is absentee voting, which most of the proposed bills do not address. The greatest danger of all is posed by insider election fraud, which can be carried out by a single administrator or voting machine company employee with the ability to completely change the results of an election with a few key strokes, and very little possibility of detection. Polling place Photo ID restrictions of the type being pushed by Republicans across the country, and already in place in Indiana, would have no effect on voter fraud criminals like Charlie White. While elderly nuns, students, and veterans have already been turned away by Indiana's Photo ID laws since implemented, White was allowed to vote last year without a problem, even though he was apparently illegally registered to do so. « PREVIOUS STORY "President Obama, Don't Just Scold the Media, Fix the Media!" "Indiana's GOP Governor Will NOT Get to Appoint a Replacement for GOP SoS Charged With Voter Fraud"
"claimed as a propaganda tool"
That is a technique taught at the Univ. of Propaganda. Divert attention by accusing the innocent of what the guilty is doing. Sounds like another johnsonville sausage packer, underwritten by a second-rate meat purveyor that sells highly processed meat-like products to working Americans. They have spent at least $60,000 promoting an all-out war on what's left of America's middle class. Man, I just don't get it. This guy was ineligible for office even before the November 2010 election but a majority of Hoosier voters elected him to office anyway. Every time I go to vote in Indiana, which is in every election, I feel like a citizen of the Soviet Republic. Show Us Your Papers, Comrade. Disgusting. It's embarrassing to be a resident of Indiana and it's my birth state. Trust me, I have a birth certificate. Is it a requirement that one be a callous sociopathic evildoer who worships at the church of Wall Street & Needless War & Lies in order to run as a Republican? Pray that someday these corporo-rats will run like lemmings over their cliff of doom. I fear America has gone past the point of no return as we deny citizens their constitutional rights, and make the poor pay for the rich man's wars. ...and as for the cowardly Dems who aspire to be Repukes, I shudder at their weak spirit and inability to see where our country has gone.